Since I switched over to my WRT54G router a week and a half ago I have been experiencing issues regarding outgoing connections, the most noticeable symptom being three quarters of the web sites timing out. Of these I could simply hit refresh and all would be well for a time but the remainder would take a while to access. Once the connection was established all was well and it appeared that I was getting faster speeds than before (one tranfer that used to max out at 600kB/sec was getting almost 1MB/sec). That didn’t help my web browsing which can establish a dozen connections for a single page. Since I only shut down the machine that used to be my router (and it was still in place as I didn’t reorganise my desk as planned) it was a simple matter of switching the cable from the cable modem back and turning it on. I have a bookmarks folder of fifteen sites that at least once a day I middle click on in order to load them all up in tabs within Firefox. A single middle click and a minute later (some of the sites are slow) they were all fully loaded (including all images) without a single timeout. Yesterday I moved my mail setup to my newly reconstructed linux box (more about my postfix, procmail, dovecot, fetchmail and spamassassin solution later) and this afternoon I moved the core network functions of DHCP, DNS and internet gateway over to my WRT54G router (running the DD-WRT firmware). These were the last two services my trusty linux box Gromit was running (for the past 30 months as a Pentium 3 666) which enabled me to simply power it down. My immediate plans are to leave it on the desk until next weekend when I plan to do a big cleanup of the desk (eg move it to vacuum behind and rearranging the cables) at which point I will put it in the cupboard. I will leave it intact on the off chance that I need to switch back or recover something I have missed. The other machine I turned off today was the temporary preston that was running in parallel while I rebuilt preston with new (and bigger) hard drives. Sometime this week the machine itself will get a fresh install of windows so it can replace my parent’s computer. Of the hard drives that used to be in preston: one 160GB will become the primary drive in my windows machine, the other 160GB will go into a USB external case for backups and the 80GB boot drive will go into the cupboard for a month or so until I am absolutely sure that I have not missed anything. What do washing machines have to do with rolling a car? So what do washing machines have to do with rolling a car? In the washing machine episode in the first season they demonstrate the power of a solenoid valve that enables a car to be rolled over by firing a piece of wood out of the bottom via compressed air. This is just one example of the tangents they go down in order to explain how aspects of the machine work. On my way home from work tonight I picked up the pair of 320GB hard drives that I am using to replace my (full) pair of 160GB hard drives. That is exactly double the capacity. It took longer to mount them in the case and attempt to arrange the cables nicely than it did to create the striped volume across the two drives and format it in the freshly installed box . I wonder how long it will take me to get used to seeing a 596GB (real GB not marketing GB) partition. I am currently rsyncing the data across from the old drives in their temporary home which should be complete in a few hours. Despite doubling the capacity I will end up with less than 50% available as it will also include data from another 40GB partition. How much memory does WordPress need? Over the past weekend I undertook the next step in rebuilding my linux boxes which was to perform a fresh install and moving services over. As expected installing Ubuntu went smoothly with the first issue arising when setting up the local copy of this site. Getting apache, php and mysql installed was pretty trivial as I just selected the appropriate packages for installation. After getting used to how the apache configuration files are arranges I quickly had two virtualhosts defined, one for my internal site and another for this site, and I copied the files and databases over. The snag came when I tried to load up this site and all I got was a blank page. At first all I could find about this issue talked about mysql not loading properly but I knew that wasn’t my issue as the code I had written from scratch that talks to the database was working fine. Eventually I found a reference to the php memory limit. At first I doubled it from 8MB to 16MB. No luck. I tried looking again for other solutions until I thought of doubling it again to 32MB. It was now working. Tonight I picked up Straight Outta Lynwood which is the latest album from "Weird Al" Yankovic. As well as liking his music I was also interested in seeing the DualDisc but the version available in Australia is a two disc set; Audio CD and DVD with the music videos. Technology aside it is great that six DVD quality music videos are included for no extra cost. 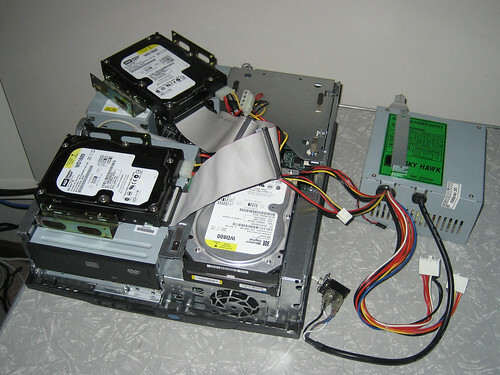 Last night I moved the three hard drives from one of my linux boxes to their temporary home in the small form factor pc that I mentioned last week. Things did not go well as the drives would not reliably power up. In hindsight this could have been expected as I was attempting to run three drives from a power supply in a pc that is only designed for one. It was only after I had returned the drives to their original home that I thought about the solution that I implemented tonight; power two of the drives from one of the spare AT power supplies that I have sitting around. This does make for an untidy solution but the extra drives were untidy anyway and it should only need to be like this for a week or so until I perform a fresh install of linux on the original hardware (but with different drives). For a while I have been half-heartedly looking for a cooking probe thermometer like I have seen used on Good Eats. I finally got tired of looking at australian places with no luck so I turned to eBay. The result? Just over a week since winning the auction I have in my possession a Polder 362-90: Cooking Timer / Thermometer (shipped from the US) which is the actual model used on the show. Last night I uploaded the photos I took two weeks ago while wandering through the city.